...that Oryx, the Taken King was originally female? "But how many more Hive abominations are still out there? Growing among the Darkness? I fear we may find out all too soon." Phogoth, the Untamed is a Hive Ogre imprisoned deep within the Moon, held in its chamber by great chains. It is a boss of The Summoning Pits Strike mission. 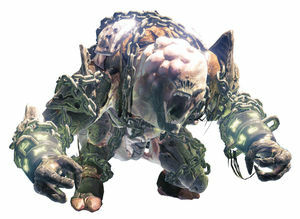 When encountered by Guardians, Phogoth breaks free from its chains and attacks, using both its brutal strength and arcane abilities in an attempt to slay the intruders. Unlike most Ogres, Phogoth's weak spot is the pulsating tumor on its chest. This weak spot can be difficult to hit when Phogoth is hunched over. Phogoth's name is reminiscent of the shoggoth from H.P. Lovecraft's Cthulhu Mythos, along with the Greek word "Phobos" ("fear"). The creature subtly resembles both Marathon's Drinniol and its spiritual successor, Halo's Sharquoi. Phogoth was renamed "Hive Abomination" as of Patch 2.4.0. Phogoth is the second biggest Hive enemy second only to Raid Oryx. Concept art of Phogoth showing a far more massive Ogre. Concept art of Phogoth and ultra Ogre. Phogoth struggling against its chains.